Friends of the Turnbull Library, Edward Gibbon Wakefield and the Colonial Dream: a Reconsideration, Wellington, GP Publications, 1997, 200 p.
There’s a lot to be said for an edited collection of conference papers, particularly if the conference was held seventeen years ago in another country. Think of it- you don’t have to make choices between clashing streams when you’re interested in both, or having to summon up a shred of enthusiasm for a session where nothing is of any earthly interest at all. You can read the argument in its entirety, rather than having the speaker say “Oh?! My twenty minutes is up already?? Oh well, I’ll leave it there”. The published chapter is often longer and more detailed than the 3000 word maximum paper that can be read aloud in 20 minutes, and it has all those delicious and helpful footnotes hanging off it. It’s faster to read it than to listen to it. Of course, not all papers are published, and it’s very possible that the one paper that had everyone buzzing and which became a touchstone for extempore comments and questions throughout the conference is not represented in the printed collection. But it might be. In August 1996 the Friends of the Turnbull Library convened a conference called Edward Gibbon Wakefield and New Zealand: 1830-1865 to mark the bicentenary of the birth of Edward Gibbon Wakefield. Apparently one commentator referred to the seminar as “the most politically incorrect event of 1996”, and you can see why s/he would say that. A Wakefield seminar could have been quite unremarkable in the 1950s, when Wakefield was still celebrated as the father of New Zealand settlement. But in 1996, the Waitangi tribunal and the work of historians like Michael Turnbull (The New Zealand Bubble), John Miller Early Victorian New Zealand: a Study of Racial Tension and Social Attitudes 1839-1852) had dulled the lustre of Wakefield entirely. 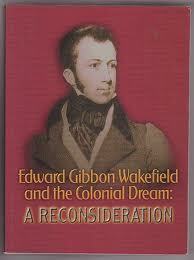 Papers from the seminar were published under the title Edward Gibbon Wakefield and the Colonial Dream: a Reconsideration, and as with all seminars, the title, themes and streams that are presented are as much a reflection of the historiography of the present as they are of the subject matter itself. The papers are divided into five parts: Wakefield’s Life; Wakefield’s Thought; Wakefield’s Historical Influence; Views of the Land and Wakefield’s Cultural Legacy. Wakefield’s Life covers biographical aspects of Wakefield’s career, and here Philip Temple gives a taster of his then-unpublished book which eventuated as A Sort of Conscience. Ged Martin presented a far more damning perspective of Wakefield, which is repeated in a different but similar paper here. A more positive view is found in the section on Wakefield’s Thought, especially in Erik Olssen’s paper which marks out Wakefield’s place within the wider field of Scottish Enlightenment thinking by looking more closely at Wakefield’s published annotations on Adam Smith’s Wealth of Nations. This paper picks up on Olssen’s Sinclair Lecture, delivered in 1995 and available here. Graham Butterworth examined Wakefield’s thought in terms of the Quaker tradition, while acknowledging that Wakefield himself did not identify as a Quaker even though there was a strong Quaker influence on his mother’s side. Part III on Wakefield’s historical influence looked at historians’ depictions of Wakefield in Australia, in terms of labour history, and in relation to the Scottish settlement at Otago- a paper that was too regional for me to make much sense of. The Views of the Land section picked up on the ecological and spatial approach to history that is still influential today. Marian Minson’s paper examined pictures and lithographs that were produced for investors and potential immigrants still in England and they are reproduced in the volume. The final section of the book, Wakefield’s Cultural Legacy takes a cultural theory approach to his work, – look! Here comes Foucault again!- examining Wakefield’s corpus of writing as artefacts existing within a particular fantasy/polemic genre, and drawing links with a 1986 novel Symmes Hole. The book commences and closes with papers by Maori presenters, both condemning the loss of Maori land. So, all in all, I enjoyed my day at a conference held 17 years earlier in Wellington. All I needed, really, was some stewed percolated coffee and a blueberry muffin for morning tea, a ribbon sandwich with incongruous and mysterious fillings for lunch, and a piece of chocolate caramel slice and a lemon tea tea-bag for afternoon tea and I’d be right!